Created 26 October 2006, links updated monthly with the help of LinkAlarm. The Deaf Rights Movement needs a kick in the pants every once in a while to get it moving again. It would be nice to have someone on the order of Martin Luther King, Jr. to spur it on, but in part Deaf people are not as visible as Black people. That is why I was glad to see the Unity for Gallaudet happenings. The president of a university's function is mainly to raise funds to keep the school running and so doesn't really have to be culturally Deaf, but in the case of Gallaudet s/he is an icon for Deaf people. But like the president of the United States s/he will have an agenda and hopefully the skill to select smart people that can get the agenda done. Therefore it is important to have a president that has an agenda to liberate the minds and souls of Deaf people. Unity for Gallaudet. (1 May 2006). "Unity for Gallaudet" - Introduction. Photos from the May 1st, 2006 Gallaudet protest and after, with subtitles. Beginning of the Unity for Gallaudet movement and the creation of the FSSA Coalition. "On May 1, 2006, the ninth president of Gallaudet University was announced. The selection of Jane Fernandes as president-elect sparked an unplanned protest in the community. Faculty, staff, students, and alumni rallied together chanting, 'Unity for Gallaudet!' Then, through a series of meetings and open forums, the FSSA coalition was established. The FSSA coalition demanded that the presidential search process be reopened. The protest continued and Tent City was erected. Over five months have passed since the protest began... Faculty, staff, students, alumni, and Deaf community members are still protesting. Unity for Gallaudet." Jonas, J. (19 April 2006). Gallaudet Student Rally. On April 19, 2006 at 5 PM, Gallaudet SBG On April 19, 2006 at 5 PM, Gallaudet SBG hosted its student rally in "celebrating" the Presidential Search Committee. In other words, they were there to share their thoughts to the packed crowd at Hotchkiss Field. Ridor, R. (25 April 2006). Civil & Jane Fernandes. Basically, few words to anti-Fernandes. theKorn. (1 May 2006). Chair of the Board of Trustees announcing next president. Expression of gratitude to I. King Jordan. Ridor, R. (3 May 2006). Restart the whole thing! Gallaudet University Protest -- The reasons behind everything else. theKorn. (3 May 2006). Enraged students walks out. theKorn. (5 May 2006). Board of Trustees open forum. Celia May and Tom Humpheries (sp?) stumped over Lynn Jacobwitzs remarks. theKorn. (6 May 2006). 9th Prez-wannabe JFK and Ex Prez IKJ fighting with students.. LACK of skills! fighting with students.. LACK of skills! wowow badddd crisis mangament with students.... UNqualified Prez finish!!! eliminate her NOW!. The VOICE from Bay Area in California. Bridgetta Bourne-Firl and David Eberwein. Upset Paul Kelly abt Lock Down. Fac n Staff arrived n surprised by our lockdown. Ridor, R. (7 May 2006). A message from Tent City. Few words from Tent City about the rain, resolve and a sign for Tent City. Kiel, P. (13 May 2006). STAMP OUT AUDISM! Deaf on Earth calling for Eyeth soldiers to bust audism! Kiel, P. (16 May 2006). Commentary about Gallaudet leadership. deberwein. (17 May 2006). Thank you, Gallaudet FSSA. Bridgetta Bourne-Firl and I spent a week Bridgetta Bourne-Firl and I spent a week at Gallaudet last week supporting the protest. This is a brief thank-you video. Ridor, R. (31 May 2006). Gallaudet & NAD. Ridor, R. (26 June 2006). For CSD-R community. prezikingjordan. (11 September 2006). Gallaudet's DPN Protest in 1988. Check out what I KING said/signed. Mayer, T. (3 October 2006). vLog 2. Tayler Mayer of DeafRead.com talks about visiting Jared Evans in San Diego, del.icio.us online bookmarking feature, donations and the importance of keeping momentumm in Gallaudet University's protest. jjuanct007. (6 October 2006). Gallaudet Univ. Students Protest. Mayer, T. (6 October 2006). Tayler Mayer: Special Interview. Special Interview with Wayne Betts Jr.
Kiel, P. (9 October 2006). REEL1of3 - BREAKING NEWS -GALLY PROTESTS. REEL2of3 - BREAKING NEWS -GALLY PROTESTS. REEL 3 of 3 - BREAKING NEWS -GALLY PROTESTS. RiversideGUAA. (10 October 2006). Deaf Riverside Cubbies! To support Gallaudet's protests! DeafImages. (13 October 2006). King orders protestors arrested. trighap. (13 October 2006). Gallaudet Protesters Arrested on 10-13-06. A rough movie made of the arrests made tonight of deaf protesters at Gallaudet University. Bienvenu, MJ. (14 October 2006). "Unity for Gallaudet" - Social Justice. M.J. Bienvenu discussing the criteria and implications of social justice and the failure of the Gallaudet Board of Trustee's presidential search process to adhere to a standard of social justice. DeafImages. (14 October 2006). 135 Gallaudet protesters arrested. Unity for Gallaudet. (14 October 2006). "Unity for Gallaudet" - About FSSA Coalition. Latoya Plummer and Laurene Simms answering some of the Frequently Asked Questions regarding the FSSA. blueflashman. (15 October 2006). Gallaudet Black Friday. Roy Ricci Painted about Jane K. Fernande Roy Ricci Painted about Jane K. Fernandes based on his expressions of his own personal experience of the event that occurred on Friday the 13th. CanucksForFssa. (15 October 2006). A series of clips of the first Canucks for FSSA rally/tent city at Riverside Park, Toronto. Tent City Clip #1. Cohen Efron, A. (15 October 2006). Gotcha, Jane! Thought provoking and controversial commentary about Jane Fernandes. ForTheRecordProductions. (15 October 2006). On October 15, 2006, the Deaf community held an emotionally charged rally at Riverdale Park in Toronto. 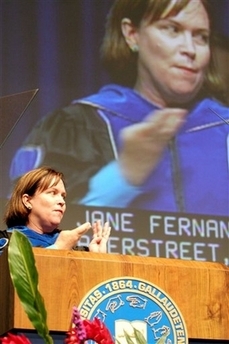 The rally was in support of Deaf students, faculty and alumni, protesting the recent selection of Jane K. Fernandes to be the next president of Gallaudet University. Video produced by www.fortherecordproductions.com Tent City Rally - Toronto (Part 1 of 2). Tent City Rally - Toronto (Part 2 of 2). Katz-Hernandez, L. (15 October 2006). "Unity for Gallaudet" - Poll Results. Leah Katz-Hernandez explains the student and faculty poll results for the final three candidates for president in 2006 -- as well as the vote of no confidence by the majority of staff/faculty in Jane Fernandes, president-elect. Martinez, D. L. & E. Moran. (15 October 2006). "Unity for Gallaudet" - Principles of the FSSA. Delia Lozano Martinez and Erin Moran explain the driving principles behind the FSSA Coalition. Moore, S. (15 October 2006). "Unity for Gallaudet" - FSSA Way. earthbabe. (16 October 2006). Unity for Gallaudet. The song by Cindy D'Angelo and George Boyd in St. Augustine Tent City. djkurs. (18 October 2006). Faculty protest. The Gallaudet University faculty marches The Gallaudet University faculty marches along in a candlelit vigil around campus on October 18, 2006 in protest of Dr. I. King Jordan's refusal to heed a faculty vote of 82% against the incoming president Jane Fernandes. Wake Up! Tara Holcomb, Amelia Sundlin, Svenna Pedersen chant a song in the support of the removal of Jane Fernandes as President designate at Gallaudet University. joshmend. (18 October 2006). Gallaudet Protests: Fire trucks. Gallaudet Protests: Fire trucks and scene. Gallaudet Protests: Fire trucks arriving. Gallaudet Protest: Frederick Tent City 1. Gallaudet Protest: Frederick Tent City 2. Gallaudet Protest: Frederick Tent City 3. Gallaudet Protest: Frederick Tent City 4. Gallaudet protest: I King Jordan sign damaged. Video of damage to "I. King Jordan Student Academic Center" sign. Gallaudet protest: Scene at Front Gate. Video of scene at Front Gate during the Gallaudet protest. deafhalibut. (19 October 2006). Special News Edition - Washington Galluadet University Alumni Association invite you to join with us. We will discuss and share about protest at Gallaudet. This Short Movies run from Part A through Part C. Tent City in Seattle Part A.
Tent City in Seattle Part B.
Tent City in Seattle Part C.
taofsdb. (19 October 2006). Tent City of St. Augustine. UNITY FOR GALLAUDET! tentcityuk. (19 October 2006). Translation of letter to Board of Trustees at Gallaudet from concerned British people. Letter from UK to Board of Trustees, Gallaudet Part Two. Letter from UK to Board of Trustees, Gallaudet Part One. erikadt. (20 October 2006). ACC DSA for Gallaudet's FSSA. Austin Community College's Deaf Studies Austin Community College's Deaf Studies Association sends their support to FSSA and all the Gallaudet protesters. Kiel, P. (21 October 2006). GALLAUDET PROTESTS UPDATE 10-21--06 Presented by Deaf Image. trighap. (21 October 2006). Gallaudet Protesters Marching to Capitol, 10/21/06. Aubrecht, A. (22 October 2006). "Unity for Gallaudet" - Additional Resources. Alison Aubrecht explains the resources available to community members. Penaranda, A. & C. Wu. (22 October 2006). "Unity for Gallaudet" - Desired Leadership. Arlyn Penaranda & Cheryl Wu outline the type of leader desired by the FSSA of Gallaudet. pwledrew. (22 October 2006). Intimidation of the Deaf should not be happening today. Recognition of the impact of the events occurring immediately at Gallaudet University on the Deaf community worldwide is significant and we must heed the warning the students at Gallaudet University sent to us. saramack. (22 October 2006). 'Unity for Gallaudet' Rally in Dallas. Canucks For FSSA. (24 October 2006). Edmonton FSSA Tent City & Rally. Representation from British Columbia, Alberta, Saskatchewan and Manitoba (Western Canada) in support of FSSA at Edmonton. Nikesha4. (24 October 2006). From Kelly Corrigan and Nikesha Crecelius. Showing our support for Gally! pwledrew. (24 October 2006). talk vs ASL in the classroom at Gallaudet. The student talked in front of the Deaf students in the classroom. Hall, K. (25 October 2006). Kristine Hall's A-Z, A-Z Gally Protest Story. ABC Story told in American Sign Language ABC Story told in American Sign Language about the current protest at Gallaudet University. jfine24. (26 October 2006). NJ Tent City. DeafRead. (28-30 October 2006). Gallaudet University Documentary: October 28-30, 2006 (16 Videos). Sunday, October 29, 2006, 5:34 p.m.
Today, we announce with much regret and pain that after serious deliberation in a special, all-day Executive Session of the Board of Trustees, we have voted to terminate Dr. Fernandes' appointment as President-Designate (currently effective) and President (effective beginning January 1, 2007) at Gallaudet University. We understand the impact of this decision and the important issues that inherently arise when a Board re-examines decisions in the face of an on-going protest. The Board believes that it is in the best interests of the University to terminate Dr. Fernandes from the incoming President's position. Although undoubtedly there will be some members of the community who have differing views on the meaning of this decision, we believe that it is a necessity at this point. The Board is continuing to meet to discuss transitional issues. It has certainly been a difficult and trying time for our Gallaudet community. Now is the time for healing. The hope of the Board of Trustees is for our beloved community to come together to work for a stronger and better Gallaudet. The Board of Trustees respects the right of people to express their views in a peaceful manner. However, individuals who violated the law and Gallaudet University's Code of Conduct will be held accountable. We expect the University to honor its long tradition of respect for each other and property and to return to normal. Golan, L. (26 October 2006). Protest at Gallaudet: By, and for, the Few. Inside Higher Ed. Searching for Answers at Gallaudet. Joey Baer's ASL VLOG has many videos on the reaction to Dr. Fernandes' termination as President Designate and some shortly before. Kinzie, S., N. Hernandez & D. A. Fahrenthold. (30 October 2006). Gallaudet Board Ousts Fernandes As Protesters Cheer, Trustees Say Law-Breakers 'Will Be Held Accountable'. Wood, K. M. (2 November 2006). The Right Future for Gallaudet. Zena, M. (25 October 2006). Analysis of Fernandes' Interview. Znuage. The Truth About the Gallaudet University Protest and President Jane K. Fernandes - The Protest and the Turmoil of Gallaudet and JKF.